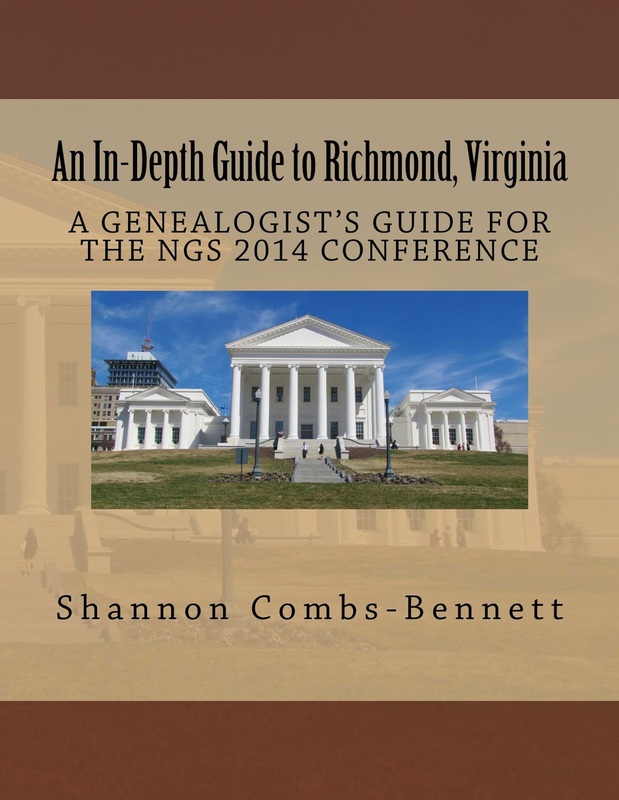 Heading to Richmond, Virginia to attend the National Genealogical Society annual conference? Well, just in time, hot off the presses is thisbook (in .PDF format) from our friends at In-Depth Genealogists. I'm certainly ordering mine right now! March 30, 2014; Utica, OH: This Guide to Richmond, Virginia was created in honor of the National Genealogical Society’s 2014 Family History Conference "Virginia: The First Frontier" held May 7-10, 2014. Within the guide, Shannon Combs-Bennett shares her familiarity with Richmond and the surrounding area to assist genealogists and family in making their trip an enjoyable one. The book includes: a Packing Checklist, Downtown Richmond City Safety Guide, Public Transportation, Shopping (ATM’s & Banks, Convenience Stores, Restaurants), Richmond Area Genealogy and other Attractions, and Genealogy and other Attractions that are short Day –Trips (within 2 hours drive) of Richmond. The book is being offered as a PDF for just $4.99 or get a paperback version that is black & white 8.5” x 11” for $9.99. Simply go to http://theindepthgenealogist.com/idg-products/ to get your copy!